I will be using them for a new content website on a niche that I’m interested to dabble in. And, one of the best way to monetize the traffic for such an informational website is to use Adsense. You’ll see that the Google Ads are strategically positioned for high click-through. The WP Colors template even use the image ad to spruce up the overall aesthetics of the web page. With good content and a touch of SEO copywriting, I am sure such web pages will make you a good Adsense income. If you are going to build a new site, there is no need to put up the Google ad. Instead, you may want to replace the Leaderboard and the Rectangle ads with some interest pictures to attract more traffic while you build up your content.Typically, I will build at least 10,000 words of good solid content – these words serve as fodder for search engine spiders. And is critical to getting my pages getting listed in the SERP. The next step would be link building. Visit forums, blogs and social networks to get people who are interested in your niche to visit your website and give you a backlinks. Once you’ve have a steady stream of visitors, you can then put up the Google Ads to monetize your targeted traffic. Remember: Good content for niche is the key to your online success. Not too long ago, Adsense templates was the hype and a very popular Adsense expert turned Internet marketer was selling such templates for hundreds of dollars. And many “Internet entrepreneurs” use these templates to build MFA(Made for Adsense) sites by web scraping article directory, blogs and news portals. Do not waste your money and time to create more web trash. You are just making it more difficult for yourself to make money online. did u had adsense templates for blogspot blogger? Good to know that you find the URL useful. There is also a tutorial on Blogger template design. I have had a bit of trouble – I ftp the adsense template, only to find there’s no adsense ads coming through! The day before I had it going fine, but today no adsense ads although clearly the code is in there. Great names but I need adsense on them. Its soo frustrating, any solutions pleeese? 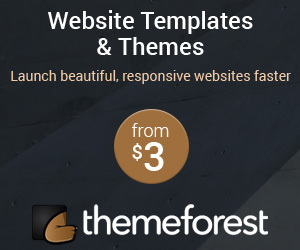 The theme you used is very popular and I have seen it working on many sites. So it is unlikely that the problem is due to Wordpress or the theme. You may want to write to Google to ask why no ad was displayed. There might be something Google doesn’t like on the domain name, your site content or the Web server. Usually the problem when ads are not showing up is the number of ads permitted by google. Each page needs to have maximum 3 ad spaces, so one of them may be appearing. thank you, it exactly what i was searching for.. Thanks for the template link. I’m using it now on my website.